10/7/06: Based on promo pics for Episode 304, it doesn't look like Baltar ends up on a basestar until that episode. What's Kara doing with that knife? Anders comes to Kara's rescue. Kara with Kacey, who she believes is her Cylon/human child by Leoben. 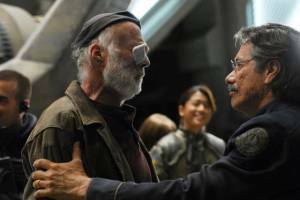 Tigh and Adama are reunited on Galactica. 10/3/06: Baltar ends up on a basestar. Kara escapes from Leoben, probably with Anders' help. Kara's "daughter" Kacey makes it back to the fleet with Kara. 9/27/06: Preliminary Episode Synopsis: The escape from New Caprica is made. Pegasus' FTL drive is damaged so it's used to ram a basestar, which enables the fleet's escape. 9/6/06: Episode has been split into two parts.